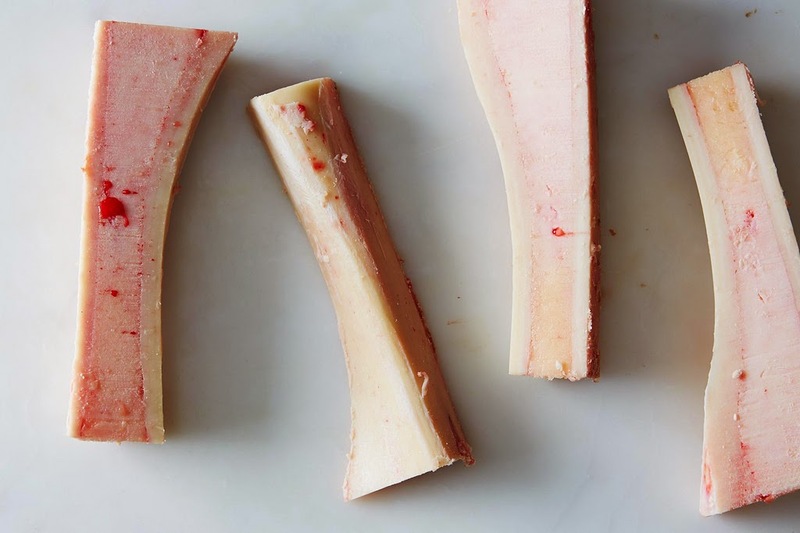 Do you always order bone marrow off the menu at a restaurant because you LOVE it? If you are a bone marrow eating-freak like me, it's your lucky day as I am going to share with you how to duplicate this sinful yet easy dish at home. I recommend calling your local butcher to see if beef bones are available. 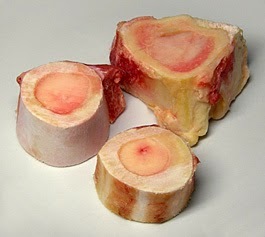 Bone marrow can be cut two ways. See pictures below. I love both cuts but most people prefer the long-way cut as you gain full access to the interior goodness. If you are a dog owner, the left over bone is a GREAT treat for them! If you live in Chicago, I purchase my bone marrow from The Butcher & Larder. Preheat oven to 450 degrees. Place bones, cut side up, in an oven-proof dish or a baking sheet lined with foil. Roast the bone until it is soft and it separates from the bone for about 20 minutes. Do not allow the bone marrow to start to bubble an drizzle out of the bone. While the bone marrow is roasting, in a bowl, combine the parsley and shallots. In a cup or small bowl, whisk container the olive oil and lemon juice so it is ready to drizzle over the parsley salad. When the bone marrow is roasted, place on a platter. Take your parsley salad and drizzle it with dressing. Season with salt and pepper to your taste. Add the toasted bread and parsley salad onto the platter and serve. To eat, scoop out the marrow with a knife or small spoon, spread it on the toast and top with some parsley salad. Enjoy!